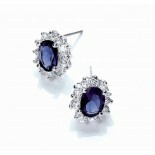 Remember the wedding of Prince William to Kate Middleton with these stunning stud earrings. Inspired by the engagement ring originally worn by Princess Diana this enchanting set will allow you to commemorate this historic occasion in style. Each piece contains a delightful hand set sapphire simulant as its centrepiece exquisitely framed by up to 14 pristine hand set cubic zirconias, a high-quality addition to any jewellery collection. Matching pendant (CZGN230) and ring (CZR436) are available.